As you drive along the ‘autostrada’ (highway) or make a stop in the ‘autogrills’ (service stations), you may see signs reminding travelers that they are ‘in a marvelous country’. What are they all about? The signs are part of a project by Autostrade per l’Italia, the society that manages Italian highways, in partnership with Touring Club and Slow Food Italy, whose aim is to promote original travel experiences around Italy, in places not necessarily touched by mass tourism, easily reached from the autostrada. The itineraries range from three-hour detours to half day, one and two days. Here are some beautiful destinations you can visit near the Italian highway. They call it ‘the valley of clocks and bells’: it is here, in the valley that frames Recco, in Liguria, that master watchmakers produce the clocks for most churches, bell towers and town halls in Italy since the 1800s. In Uscio, stop at the Roberto Trebino museum, which traces the history and production of clock, from ancient tower clocks to modern-day watches; visitors can learn about the mechanisms and work of the Trebino watch company, one of the most important in the world, supplier of the Vatican and the Quirinal Palace among others. 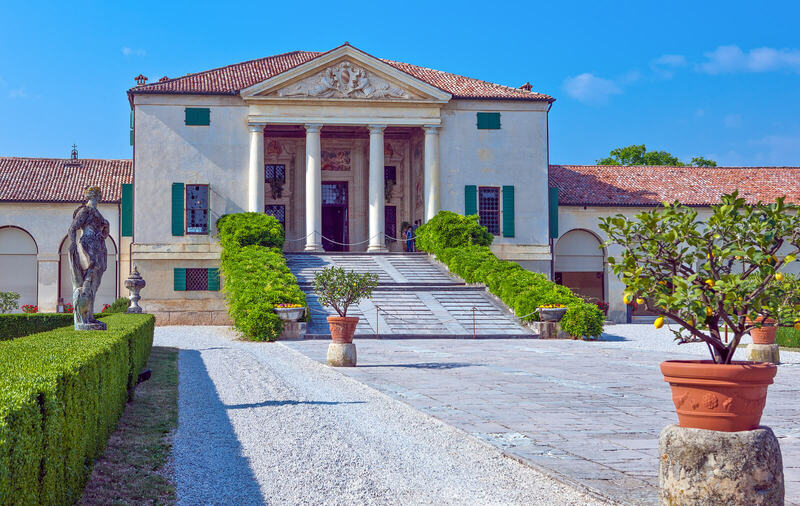 The Palladian Villas of the Veneto are villas designed by architect Andrea Palladio, erected in the 16th century in the north-eastern region of Veneto, when the area was under the political control of the Venetian Republic. Most villas are listed by Unesco as part of a World Heritage site named City of Vicenza and the Palladian Villas of the Veneto. Palladio, who is considered one of the most influential architects in history, was influenced by Roman and Greek architecture. He was commissioned to build a series of country houses for wealthy families, who wanted a second house besides the palazzo they owned in town. The villas were often given the family surname. This itinerary touches on two splendid villas, at the foot of the Asolo hills, Villa Maser, with its typical neoclassical profile, and Villa Emo. Between them, the delightful borgo of Asolo, for centuries a destination of artists, poets and intellectuals, Italian gardens and vineyards. During the late Middle Ages/early Renaissance, Cesena prospered under the rule of the Malatesta, and sites from that era survive, the most significant example the Malatestiana Library, which opened in 1454 and is the first civic library in Europe. It blends humanistic principles with architecture normally reserved for religious buildings and preserves precious manuscripts, engravings and codes. Also worthy of a visit is the Rocca Malatestiana, one of the most imposing of the region, with two massive towers called the ‘Male’ and the ‘Female’. Inside the Femate Tower is the Museum of Agriculture, which offers visitors a complete picture of rural life in Romagna over different ages; the Male Tower hosts a permanent exhibition of Malatestian ceramics. Vallombrosa is a Benedictine abbey in Reggello, 30 kilometers southeast of Florence, in a peaceful position among the Apennines, surrounded by forests of beech and fir trees, created and cared for by the monks of the Vallombrosa order through the centuries (the area was declared Natural Biogenetic Reserve in 1973). 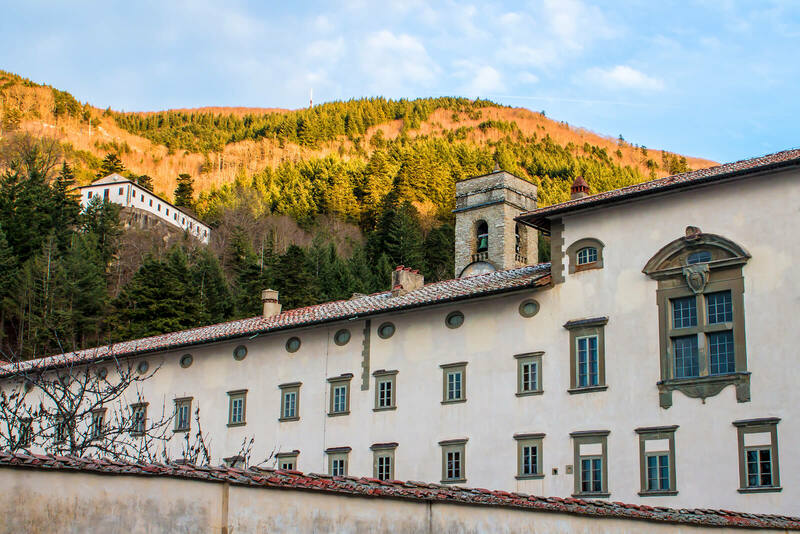 In 1036, Florentine noble Giovanni Gualberto retired to a hermitage in Vallombrosa, where he first created a wooden oratory; the community that developed then built a church, which was later expanded to also include a monastery. The large cloister, the sacristy, and the tower date to the 15th century, while the current aspect is from the 18th century. Orvieto is a small town in central Italy perched on a tuff cliff, encircled by defensive walls built of the same stone. Sights not to miss include the Duomo (1290), which features a mosaic façade and houses a marble sculpture of the Pietà; the Pozzo di San Patrizio (16th century), built for the popes, a spectacular 62-meter deep well with a double spiral staircase; a network of underground caves that testifies to the Etruscan roots of the town. Artifacts from that period, including ceramics and bronze objects, are on display at the National Archaeological Museum. Second in size only to the Colosseum, and possibly serving as its model being the first amphitheater of the Roman world, the Amphitheater in Santa Maria Capua Vetere, one of the most important archeological sites in Italy, was built at the time of Augustus, between the 1st and 2nd centuries AD. Visit the annexed museum, where you can relive the famous slave revolt led by Spartacus in 73 BC. 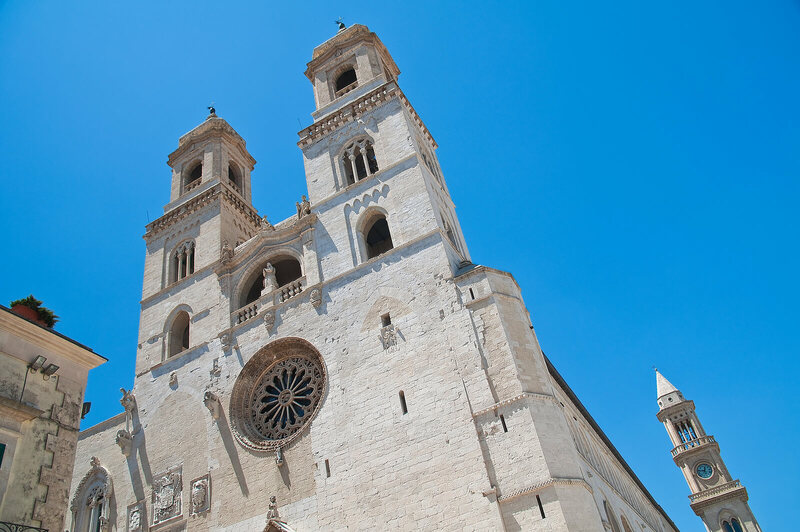 Puglia never ceases to amaze: besides its seaside and white villages, it offers little-known architectural gems, such as the majestic Cathedral of Altamura, founded by Holy Roman Emperor Frederick II, with its magnificent façade and intricately carved portal. While in the area, don’t miss a tasting of the typical bread, the Pane di Altamura, made from durum flour from the Altamura area, and granted PDO status. After your foodie break, continue to the Dauni mountains or to the Castellana Caves, where you can admire impressive stalactites and stalagmites that go 60 meters deep.